There are many artists whose name is not a household word. That is particularly true for women, and African Americans. Additionally, artists who are self-taught and have a unique vision aside from mainstream art are also neglected in the annals of art history. As I have posted in the past, I reject the terms “folk art” or “primitive art” as these designations have negative connotations, particularly a “lack of substance.” Interestingly, most self-taught artists feel compelled to follow ideological or religious themes as opposed to common subject matter. Many self-taught come from economically and socially deprived areas, and their art developed late in life. This is true in the art of Minnie Evans. Evans was born in Long Creek, North Carolina and moved to Wilmington in 1893. She was raised primarily by her maternal grandmother. Her keenest interests in school were mythology, history, and biblical stories. Much of her art was influenced by visions and waking dreams. These dreams concerned nature and life force combined with the spiritual power of the Bible, part of her deep Baptist faith. 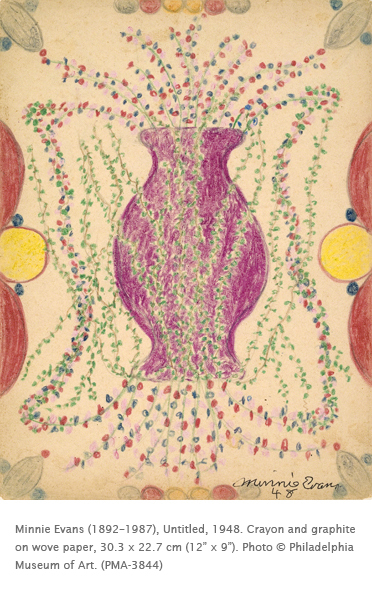 It was just such visions that prompted her to start drawing only at the age of 43 in 1935. She produced two drawings at that time and then not again until five years later. After 1949, she spent most of her life around Airlie Gardens, a plantation opened to the public. She became the gatekeeper and displayed her work there, selling each drawing for fifty cents. Even while working in the gatehouse, she continued to hone her craft. The lush flora of the gardens was an inspiration to many of her works, evident in this drawing. Although Evans’ work has been compared to work from Africa, the Caribbean, Iran, and Egypt, the personal vision of the artist transcends any one style. This work, with its symmetrical balance and flat, decorative composition, is reminiscent of many women artists of early America. In 1962 Evans’ work was discovered and photographed by a college student who later became an advocate for the artist in New York. Evans eventually exhibited her work in New York, leading to a one-person show at the Whitney Museum. Despite the success of her work, Evans reportedly never considered her work “art,” but rather an inner necessity, compelled by her spiritual life. On May 14, 1994, she was honored by “Minnie Evans Day” in Greenville, NC. Activity: Create a flower still life like Minnie Evans. Study a bouquet of flowers in a vase and choose colors of crayons or colored pencils in hues that are personally satisfying, not necessarily realistic. Try and simplify the forms of the flowers into shapes, and do not be concerned about space or background. Pay close attention to symmetrical balance, and the use of line to create interesting rhythm or patterns.